Aberdeen Village is a retirement home in Olathe that the office visits regularly. The team spends time there adjusting glasses for the residents, setting up appointments and educating just how important healthy eyes are. The residents love when we come to vision and there is often a line formed by the time we get there. We have grown very close with all of the residents and staff at Aberdeen Village and love volunteering there. 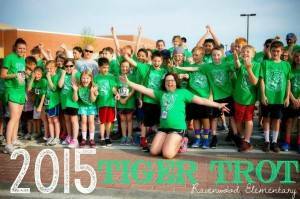 Recently, Ridgeview Eye Care supported Ravenswood Elementary School in their annual Tiger Trot fundraiser. The elementary school collected close to $13,000 that will be used to support Ravenswood students as they embark on their educational field trips throughout the year. Ridgeview Eye Care participates in numerous health fairs every year. Health fairs at John Deere, DH Pace and Garmin are just a few to mention. We take a wide range of insurances so letting companies know we take their specific insurance is very important for their employees to help maximize their benefits. Ridgeview Eye Care in DeSoto has an amazing safety program that the local businesses have come to love. We are able to provide safety frames and eye health exams for the employees of these businesses. In case of an after hours eye emergency, please call (913) 261-8327 and follow the emergency prompts.